Banner background designed by ikatod / Freepik. The following is a guest blog by Vijai Shankar – Senior Director of Industry Marketing at 7.ai. Digital transformation. It’s disrupting every industry and impacting how you deliver a great customer experience. Companies that ignore it risk their very survival; but those that embrace it can dramatically improve customer satisfaction and drive greater value – without driving additional costs. In the world of customer service and support, there is significant change happening from both a technology and consumer standpoint. Customers are more sophisticated and have increasingly higher expectations of experience from the companies or brands they interact with, while new and innovative technologies are enabling companies to transform how they provide support. From artificial intelligence-based chatbots to messaging applications, it is very important to clearly understand how different technologies can be used to transform the customer experience (CX). Businesses in all sectors are beginning to realize the importance of digital transformation and are raising the bar for each other. At the recent Customer Response Summit in Chicago, organized by Execs In The Know, I observed and interacted with executives from brands and we all agreed on one thing: customer experience is the forefront of digital transformation, and as each brand improves their service and experience they set the bar for the rest, even across industries. The growth of mobile has put today’s customers in the “Experience Era” and businesses need to support customers across multiple, interconnected devices and channels, with the optimal customer experience. Natural language processing, artificial intelligence and machine learning are the foundation of digital transformation and exponentially drive the potential and value of virtual agents or chatbots now and into the future. Analytics, Big Data, Customer Effort, Customer Experience, Customer Journey Mapping, Customer Management Professional, Customer Service, Digital Engagement, Duke Energy, Intelligent Chat, Virtual Agents, Visual IVR, 7 Inc.
Thursday, March 19th at 12:00 PM CDT. In a world where 90% of interactions cross devices during a single journey, and 81% use three channels to engage with customer service, how do we ensure our customers are experiencing a seamless transaction? In this session, we will explore how to identify and mend broken customer journeys, often caused by automation, escalation, and channel crossing. Duke Energy, the largest electric power holding company in the United States, supplying and delivering energy to approximately 7.2 million U.S. customers, will give insight into their strategic vision for digital customer engagement. You will learn how partnering with customer engagement software and services provider, 7 Inc., allowed them to optimize their customer journey, improve customer loyalty, increase customer satisfaction, and gain a competitive advantage. Join speakers Chad McDaniel from Execs In The Know, Daniel Hong from 7 Inc., and Yogena Austin from Duke Energy for this live webinar. 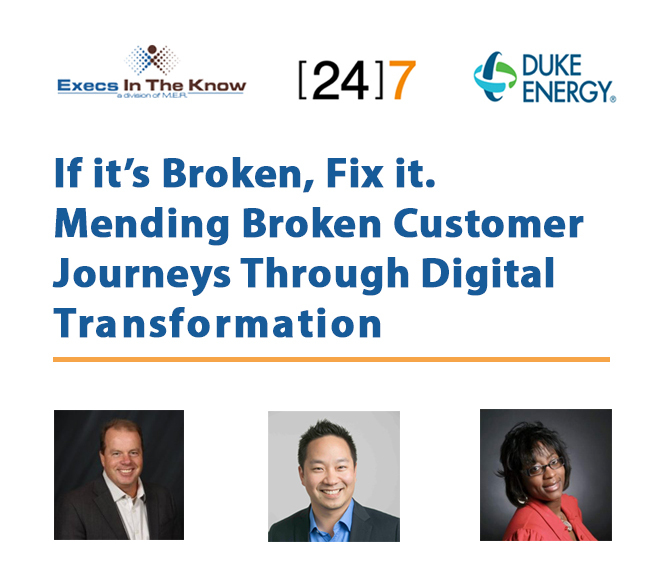 Analytics, Customer Effort, Customer Engagement, Customer Journey, Customer Satisfaction, Digital Transformation, Duke Energy, Intelligent Chat, Virtual Agents, Visual IVR, Webinar, 7 Inc.